Pinned to my cubicle wall I still have an old screen-printed T-shirt with a red arrow and the tag line “The Right Direction.” This is a memento from a Pony Express Days long before my time—when the Ranches was only a mini-golf course, before fiber heard of in Eagle Mountain, and before the FCC approved the sale of Eagle Mountain Telecom to Direct Communications. Still, we showed up at Pony Express Days faithfully to try win goodwill with the residents by doing things like handing out free Idaho potatoes with the tag line “Free Taters for Out of Staters.” (We still have a few of those custom printed bags up in the attic too.” Each year since then, we have sponsored Pony Express Days, because it’s a great time to feel and be part of the community, and this is the premiere celebration for Eagle Mountain City. Pony Express Days is my biggest week on our annual marketing calendar. We serve a lot of small communities, and go to many county fairs, city celebrations and parades, but there is nothing else like it. The sound of thousands of kids lining the street screaming out for Frisbees, and high-school marching bands; the smell of sunscreen in the desert heat, the excited teenage beauty queens waving from their floats, the annual traffic-jam in Eagle Mountain—who would ever want to miss it? My first Pony Express Days was 2006. Direct Communications Cedar Valley was a start-up company—operating out of the fire station attic in the city center, and the marketing budget was very small. However, we ordered some cool stuff—350 beachballs and 350 Frisbees. Blowing up all those beachballs to throw out of the back of the truck must have left somebody breathless—I can’t remember who was the lucky person who was assigned that job. In those days we also gave out color t-shirts rather than white ones, and there weren’t a lot of other businesses occupying booths at the park. Still, we didn’t get a whole lot of visitors to our booth—a few curious onlookers and kids wanting balloons. 2007 was memorable because of our foray into the mobile phone world. We tried to use Pony Express Days as a launchpad for our great new cell phone product, Direct Mobile, which was actually just a version of Verizon Wireless, but without any of the latest and greatest handsets. It was doomed to failure from the outset. We didn’t sell a single cell phone at the booth, and that product didn’t make it to the next Pony Express Days. That year was also unique because we gave out sunglasses with neon frames—perhaps you still have a pair lying around in a kids toy chest in your basement. 2009 was the beginning of really busy times at Pony Express Days, and hard work at the booth. That year we launched the free ephone bundle, and starting speeds of 3Mb for $29.95, which was a really great deal. Each year the back of the truck was filling up more with little girls as we employees grew our families, and that year there was standing room only. The kids just love to throw out candy to the other kids though and see them scrambling for Frisbees. We gave out silicone wristbands for the first time that year too, and as a promotion, gave away a free ipod with a broadband subscription. I think we closed about 30 sales that day, and we thought we had hit the big time. 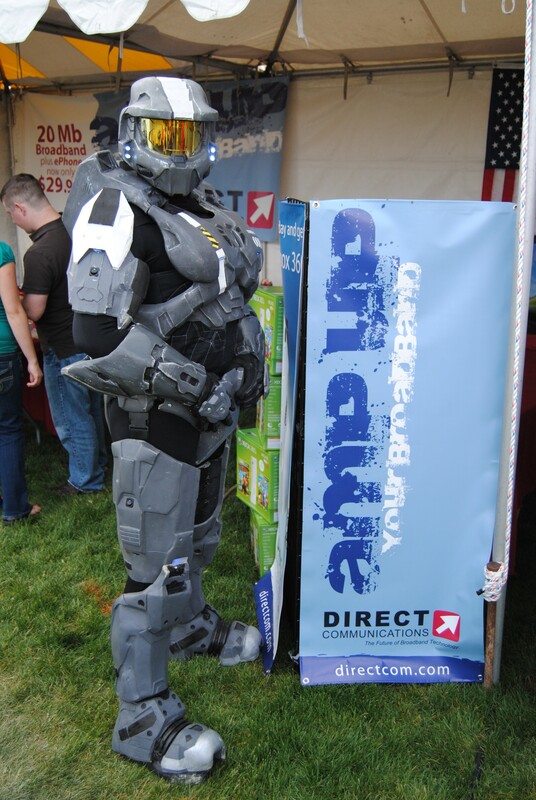 By 2010, people had really begun to catch onto the idea that they could have our better broadband service without the additional expense of a regular landline, and also online video and gaming was beginning to grow, so we tried to ride that wave with our Xbox promotion. If we could get people to watch more online video, we felt we would have a permanent customer. We want our customers to use our broadband as the primary source of entertainment in their homes. Xbox was a perfect promotional item for that marketing strategy. Our unique competitive advantage is that as the only wire-line broadband provider in the area, we are able to provide the higher speeds and unlimited bandwidth needed for high definition video streaming. Our wireless competitors fear streaming—we needed to encourage it. So, we paired our “Amp Up your Broadband” campaign with a free Xbox, and had our best Pony Express Days ever. We gave away over 160 Xboxs to new customers. So, what will we be doing in 2011? A lot has changed since 2005. Most people in Eagle Mountain know who we are now, our fiber-optic network is purring, and each year we get fewer rude comments and obscenities yelled at us during the parade, and more smiles. The parade is bigger and lasts longer. The booths are now always full and are incredibly expensive. Our schedule of events we are involved in during the week leading up to the final Saturday has grown each year—we work all day and hold focus groups each night. We will be doing many of the same things, throwing out t-shirts and Frisbees, talking to as many people as we can, but we will also have a couple of new, big things to announce. Stay tuned—we are certainly planning for another fun year, and have some very good news for everybody.